Robbert van de Corput began DJing at age 12 and has experienced a meteoric rise to fame ever since, winning several awards and reaching #1 positions on several charts with his original songs “Spaceman” and “Apollo”. Hardwell has worked with artists such as Rihanna, Dannic, Amba Shepherd, and Showtek, and performed back-to-back with his inspiration Tiësto. Hardwell seems to prefer a modest desk-monitors-and-screen setup with Logic Pro over a fully-equipped, hardware-heavy setup, though he does still occasionally use an Access Virus TI2. His live performance gear consists of the standard CDJ-and-mixer fare. What kind of Studio Equipment does Hardwell use? Click here to let us know! At 4 : 39, you can see the Tube-Tech SMC 2B Multiband Opto Compressor in Hardwell's effects rack . At around 1:25 into this video tour of Hardwell's studio, as the gear he uses is flashing on the screen, his M-Audio Keystation 49es MIDI keyboard controller can be seen on his desk. From an 2011 interview, when asked what equipment he uses to produce: "I’m using Logic 9 on my Mac Pro and Apogee Duet soundcard." 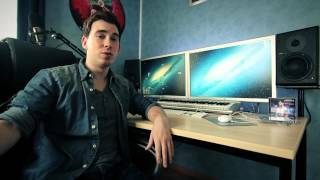 In a 2013 video, at the 3:58 mark, Hardwell is asked by a fan what sound card he would recommend for a starting producer. Hardwell responds by saying "A sound card I can recommend is this one, the Apogee Duet, I've used this one for almost 5 years, and it's definitely one of my favorite sound cards." The Apogee Quartet Audio Interface can be seen on Hardwell's desk as part of his studio setup. Manley Massive Passive Stereo Tube EQ is one of the new items in Hardwell's new studio, as shown in this Facebook post. Hardwell has a variety of Vicoustic products in his studio space for acoustic treatment. The Super Bass Extreme (SBE) is a corner mounted bass trap, and can be seen in this photo. The Multifuser by Vicoustic can be seen used in the background wall of the studio! The image features both Hardwell and Studio Designer, Morel Muziek. As can be seen in the image. Hardwell has the Vicoustic Flexiwave attached to his ceiling. Thermionic Culture The Culture Vulture is one of the pieces of equipment in Hardwell's studio. In this photo of Hardwell's new rack at the top below a Culture Vulture you can see the Phoenix compressor by the same company. In this video at 0:06 Hardwell can be seen using the Roland A-49 (the white version) as his main MIDI keyboard. The TC Electronic Clarity M Loudness Meter used by Hardwell as seen on his Instagram post. What kind of Software Plugins and VSTs does Hardwell use? Click here to let us know! 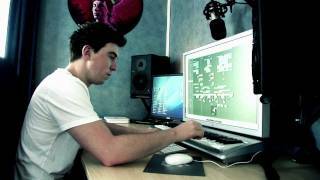 In a video of his studio setup and equipment, Hardwell shows he owns the UAD-2 Satellite QUAD card. Hardwell lists the very popular Sylenth in his top 3 favorite synths, along with the Access Virus Ti and the Nexus. In his hit track "Apollo" the lead sound is made by layering a sound from the Sylenth with two sounds from the Nexus synth. Hardwell is listed as a artist using the Sausage Fattener on Dada Life's site. At 11:23 in this video, you can hear Hardwell begin to talk about Cytomic's The Glue Compressor Plugin. At 16:32 in this video you can see Hardwell talking about iZotope Ozone 5 Mastering System, which he then opens within Logic and discusses. Responding to a question about what plugin he uses to give his sounds more power, Hardwell says he uses the Noveltech Character Plugin. This is from the Facebook Studio interview at Amsterdam Dance Event 2014. His reply is around 09:12 in the video: "To give my sound more power, I think definitely when it comes to synths, it’s really important how you EQ your synths. But one of my plugins that I basically always use on synths and baselines is from Noveltech, it’s called Character. Basically it just boosts the character of the sound itself. So your sound is getting more powerful, and it sounds so much better. There’s a lot of good presets in it, so you definitely need to check that plugin out." At 2:31, one can see Hardwell using the Spire plugin. At 1:38 he talks about and shows Wavefactory's Trackspacer plugin. He mentions that he just started using it and that it helps him to separate the different frequencies for his sidechain. Hardwell's gear is on Equipboard.